YouTube launches Music Key subscription service | What Hi-Fi? The much-rumoured YouTube Music Key streaming service has launched today in beta, bringing "high quality" music files, offline listening, official music videos and more for a monthly subscription fee. YouTube Music Key sees YouTube for the first time offer a paid-for, premium model alongside its hugely popular free video site. Music Key will cost £7.99/month at launch, set to rise to £9.99/month in line with the rest of the market, and launches today for selected users. Premium users will get access to various familiar music streaming service features to make YouTube Music Key a serious rival to existing services such as Deezer, Spotify and Qobuz. All YouTube users will, from today, see a new Music homepage on the YouTube.com website and Android app (iOS is coming soon), offering official artist pages, complete albums and discographies, playlists and official music videos. YouTube is also promising "high-quality" songs from its music partners. We await confirmation of the bitrate. Whether you pay for YouTube Music Key or just use the new look YouTube, it's clear there will be a renewed focus on pushing official, label-approved music content. YouTube has said this official content will be much easier to find, presumably implying unofficial content will be pushed down the pecking order as a result. YouTube Music Key will work with the Google Play Music streaming service from Google, with a Music Key subscription also giving you access to the Play Music All Access service. The latter will soon incorporate music videos from YouTube, too. Google's two streaming services will arguably now pose more of a problem for the fledgling Tidal music service, which launched last month offering CD-quality lossless streaming - but also making a big play on its editorial content, including music videos, something now very much offered by Google's services. 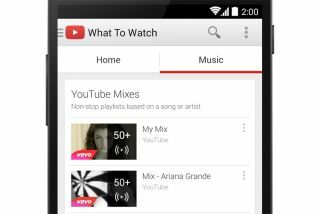 YouTube says it's first and foremost making it easier to find music on YouTube, thanks to a new music tab on YouTube.com and the Android app (coming soon to Apple devices). This page will show your favourite music videos as well as recommended content and playlists. You can make your own playlists or binge on your favourite artist by letting YouTube shuffle their discography for you, plus you can cast your tunes to a Google Chromecast or other 'cast ready' device. And, for the first time, YouTube is promising "full albums in high quality audio" - though there's no indication at launch what bitrate this refers to - as well as official music videos. We'd be surprised if the sound quality is any higher than 320kbps and frankly unsurprised if it's actually lower. iTunes of course still trades in 256kbps downloads, albeit in the superior AAC codec rather than MP3. But the real news comes with the beta launch of YouTube Music Key, a fully-fledged streaming music service that will cost £7.99/month at launch (£9.99 full price) and bring with it offline playback, multi-tasking with the YouTube app, an ad-free experience and free access to Google Play Music. Offline playback is a basic feature on Spotify and other services, allowing you to essentially download your tracks to your phone or tablet for playback without needing an internet connection or using your data allowance. And now it's available for YouTube thanks to Music Key. Similarly, you can't currently navigate away from the YouTube app on your phone - to check a message or browse the internet, for example - without the YouTube music playback stopping. Again, if you opt to pay for the new YouTube Music Key streaming service, then you can. There will be no ads for premium users and you'll also get access to Google Play Music, complete with its 30+ million song library. Google Play Music users will now also get access to some official music videos from YouTube. YouTube Music Key is now available as a beta service for YouTube's "biggest music fans first" and is then promised to roll-out to more users via invites through the app or via email. Billing itself as "the biggest music service on the planet", it's clear YouTube has big plans for music with its subscription service, and with artists such as Katy Perry already having over 14 million subscribers and having clocked-up over 4,360 million views to date, it's certainly got a serious platform to build upon. For more information and to register your interest you can head over to the YouTube Music Key website.